In 1918 women in Britain over the age of 30, meeting certain property qualifications, were given the right to vote, and in 1928 suffrage was extended to all women over the age of 21. This could be someone well known, or it could be someone you know personally. The work could represent an individual or a group. 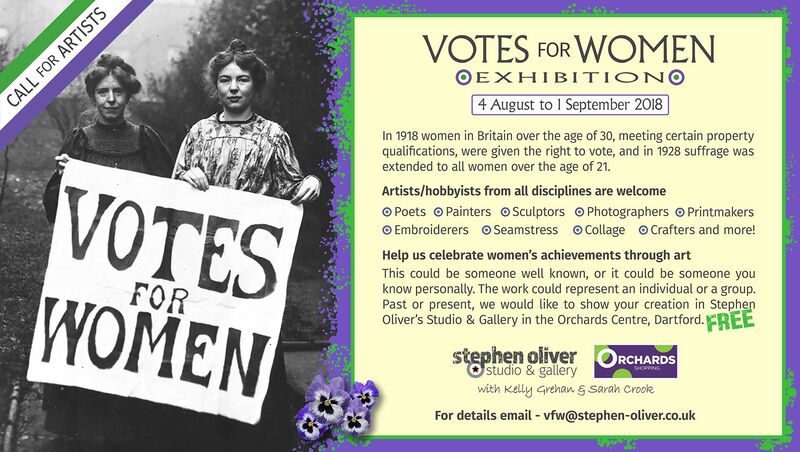 Past or present, we would like to show your creation in Stephen Oliver’s Studio & Gallery in the Orchards Centre, Dartford. Sculptors, painters, photographers, printers, illustrators, typographers, crafters and more. You are invited to submit an artwork on the topic of ‘celebrating women of achievement’. This could be someone well known, or it could be someone you know personally. The work could represent an individual or a group. Submissions to be received at the gallery by 21 July 2018. If the finished work is on paper, please mount on card for display purposes. If on canvas/frame, please provide a means of hanging (cord/wire across the back). The gallery is not responsible for loss or damage to works. Your work must be collected at the end of the exhibition. 2D – 80(h) x 100(w) cm. 3D – a footprint of no more than 50 x 50 cm. If a school group – name of school and teacher (and names of individual artists if you wish). A brief description of the reason you chose the subject. – Download our Exhibition Submission Requirements. – Download our Exhibition Submission Requirements for Schools.